We studied in Chap. 14 the digital Moving Average LTI systems. It was clear that those filters are simple to implement because their impulse response is finite. They allow one to filter out totally some chosen frequency components; however, they have the disadvantage of having a frequency response that varies slowly. The autoregressive filters presented in this chapter can be higly selective but their disadvantage is that their impulse response has an infinite length. They are digital equivalents of the analog filters presented in Chap. 10. This chapter begins with the presentation of the AR filters of the first and second order. We determine their impulse responses, study their stability, and calculate their transfer functions and their domain of definition in the z-plane. As before, the geometric interpretation of the frequency gain provides a thorough understanding of the filter’s mode of operation and gives way to generalization toward ARMA filters (Autoregressive–Moving Average) of which several examples are studied. 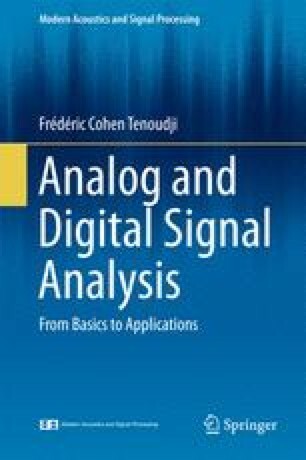 It is interesting to be able to use the many accumulated results in the literature on analog filters; various methods of passing from an analog filter to its digital equivalent are presented, but, in essence, the equivalence cannot be performed perfectly. We study the pros and cons of commonly used methods.